Oh, did I mention we’re moving? We’re moving. In eleven days. We’ve found a place, about a five-minute bike-ride away from where we are now, in a nice little neighbourhood where there’s a grocery store so fancy that there are two cheese sections, one that’s open to the general populace and one behind glass, which people like me can’t afford to buy from. They sell interesting things like San Marzano tomatoes, squid ink pasta, jasmine tea soda, and beautifully aged dark red meat. There’s a Williams-Sonoma across the street. The apartment is also very nice, though there isn’t a balcony so the barbecue won’t be coming along. It’s cheaper than where we are now, and a little bit bigger, and we can have a dog or a cat there if we want. I want. Nick is being difficult. The kitchen there is smaller, but there are more windows, and so maybe my photographs will come out clearer, less blurry, and maybe less yellow and dark. There is a separate space for a dining room. There are closets. I am very excited. But we have so much stuff, and the kitchen here is full-to-bursting. So we’re not buying anything new, not until the new place is unpacked and set up and we’ve determined how much of my clutter will have to be stored. And that is why today, I want to tell you about risotto. Which I guess isn’t really risotto at all. We’re using up the stuff in the cupboards, and a year or so back, I was on a bulgur kick, because it’s such nutty, chewy stuff and I wanted to make Turkish food and it’s something other than pasta or rice. 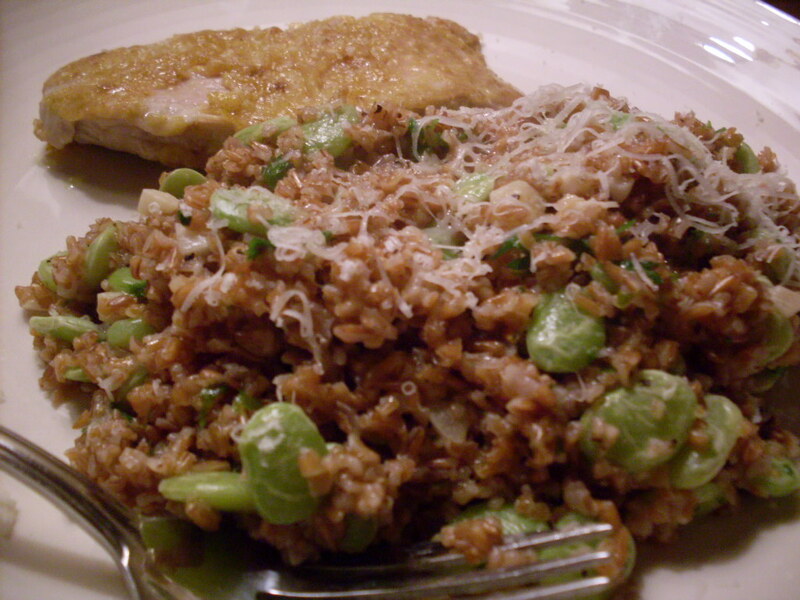 It’s toasted cracked wheat, which sounds just lovely, and you can use it in place of rice in pretty much anything. You can even make a kind of risotto out of it, and it’s wonderful, especially if you live with someone who loathes risotto. You make it the same way that you’d make a real risotto, though you use less liquid, it takes twenty minutes instead of thirty, and you don’t have to pay as much attention to it. It’s not as creamy as risotto, but you can make up for that by adding vegetable puree, perhaps, or an extra creamy cheese. If you want. I used lima beans because I had some in the freezer, but Nick thought this would be much better with peas. Who knows? Give it a try. Play with it, and tell me what you think. Melt butter in a heavy-bottomed pan on the stove. Add onions and garlic, and coat with butter, frying until the onions are translucent. Stir in bulgur, and allow it to sop up any of the remaining butter. Pour in about half a cup of chicken stock, stir, and let absorb. Keep adding chicken stock in small doses, for about fifteen minutes. When the last of the chicken stock is absorbed, and the bulgur has puffed up and softened, finish with the wine. Throw in the frozen lima beans, and the parsley. 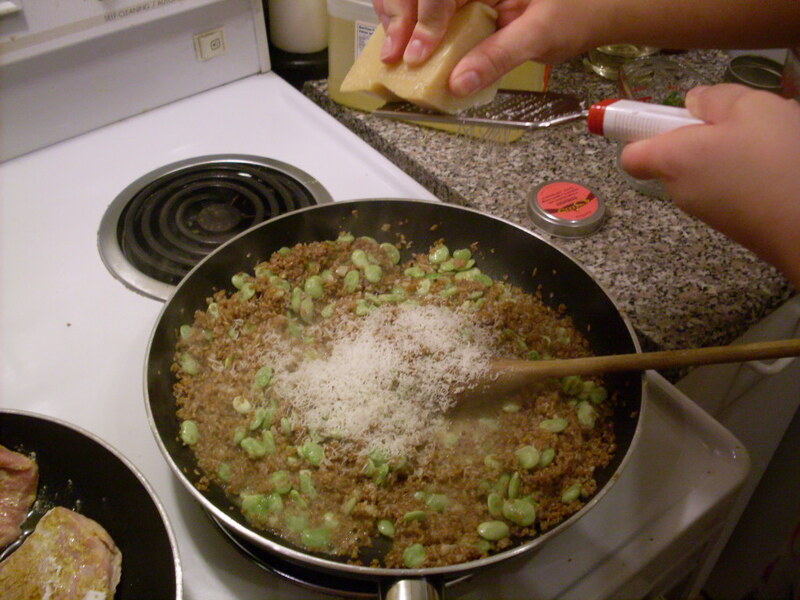 Toss with cheese, and adjust seasonings to your liking. I didn’t add any salt, because the cheese and the stock was salty enough, but Nick said it wouldn’t hurt to add a tiny bit more. Serve on its own, or as a side dish. It’s very unusual, with a texture reminiscent of wild rice and a nutty, toasty taste. It’s very good, and quite filling – very high in fibre, you know. And it’s a nice change, if you’re eating a lot of rice or pasta. 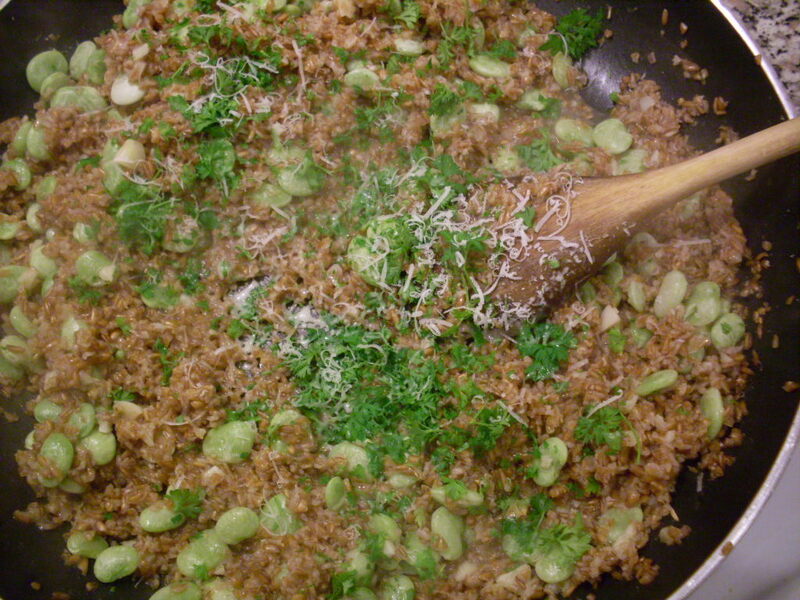 And not scary at all – bulgur is an easy place to start if you’re looking to expand your eating horizons. I even add a handful of it to regular risotto sometimes, for texture’s sake, and it’s quite good. Anyway. It’s Nick’s birthday, and I promised I’d let him sleep, but I also said I’d treat him to some breakfast. I should go figure out what there is in the fridge and maybe whip up some eggs or something. And then start packing. < Previous Buttermilk apple fritters: Breakfast of big-boned champions. Next > When it’s rainy and windy and there are boxes everywhere and if you live in Vancouver, go to The Three Lions Café.